Lighthouse photos really do make beautiful coffin designs. 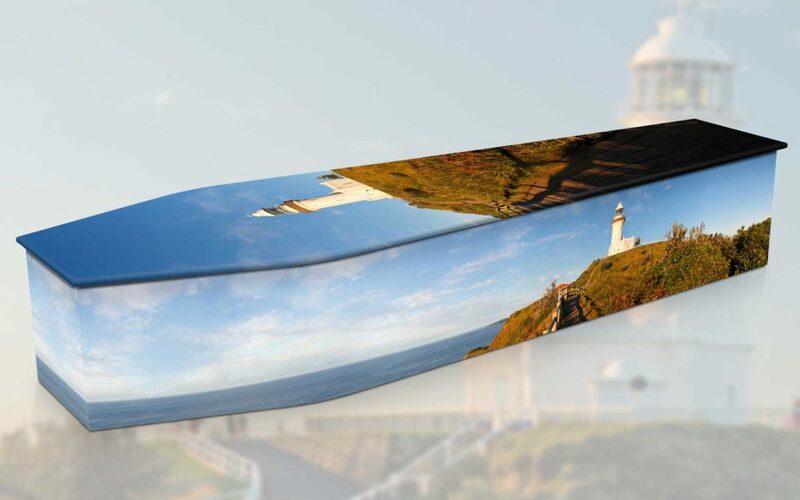 Especially this panoramic lighthouse photo our designers Natasha and Vanessa sourced to create this coffin and urn. 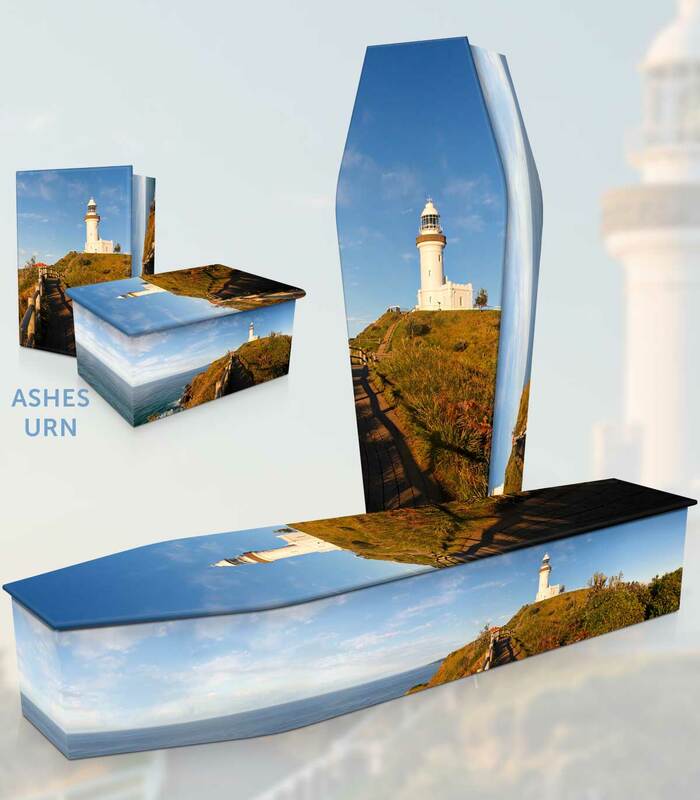 The Byron Bay Lighthouse Expression Coffin is one of our latest designs I wanted to share with you. I’m sure you’d agree that lighthouses seem to hold significant meaning for many people. There’s something symbolic about them: strength, guidance, hope etc. Combine that, and people’s love of the ocean and this may become a very popular design. Did you know Expression Coffins are patented? They’re not like other coffins. We use a modern coffin design which features rounded lid edges with no mouldings. This allows our image wraps to flow seamlessly into, around and under the coffin. We make the raw coffins in-house from E-Zero Customwood (MDF). This is the most eco-friendly fibreboard and is Australian grown timber. You can confidently use it for both burial and cremation. We use only water-based inks. These don’t contain solvents. You may select any handles and drapery you wish. Then, we can trim and mount the coffin for you… so it’s funeral-ready. Our coffins are all handmade in Australia, then delivered on our truck to your funeral home for the funeral. Each coffin is part of our Memorial Tree Program. A certificate is issued with each coffin to explain the tree planting actions taken on your client family’s behalf. They’re a larger standard size. Funeral directors appreciate the extra room in the coffins: L1900 x W550 x D325 (mm). Matching ashes urns are available for every design. Families may like this option as a lasting memento. Any design is possible. We have a database of millions of high-res images we can use to create a special coffin for any family you are serving. Would you like a unique design for your funeral home? Get in touch to discuss your ideas.